Since March 2011 information about the price of tap water throughout France is gathered through a crowdsourcing experiment. In just 4 months, over 5,000 people fed up with corporate control of the water market took the time to look for their water utility bill, scan it and upload it on Prix de l’Eau (‘price of water’) project. The result is an unprecedented investigation that brought together geeks, NGO and traditional media to improve transparency around water projects. The French water utility market consists in over 10,000 customers (cities buying water to distribute to their taxpayers) and just a handful of utility companies. The balance of power on this oligopoly is distorted in favor of the corporations, which sometimes charge different prices to neighboring towns! The French NGO France Libertés has been dealing with water issues worldwide for the past 25 years. It now focuses on improving transparency on the French market and empowering citizens and mayors, who negotiate water utility deals. The French government decided to tackle the problem 2 years ago with a nationwide census of water price and quality. So far, only 3% of the data has been collected. To go faster, France Libertés wanted to get citizens directly involved. 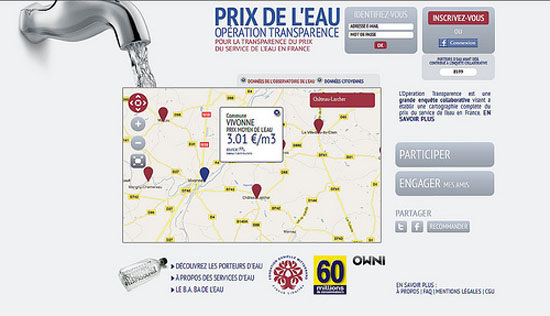 Together with the OWNI team, I designed a crowdsourcing interface where users would scan their water utility bill and enter the price they paid for tap water on prixdeleau.fr (price of water). In the past 4 months, 8,500 signed up and over 5,000 bills have been uploaded and validated. While this does not allow for a perfect assessment of the market situation, it showed stakeholders such as national water overseeing bodies that there was a genuine, grassroots concern about the price of tap water. They were skeptical at first about transparency, but changed their minds over the course of the operation, progressively joining France Libertés in its fight against opacity and corporate malpractice. What can media organizations learn from this? NGOs need large amount of data to design policy papers. They will be more willing to pay for a data collection operation than a newspaper executive. Crowdsourcing works best when users do a data collection or data refining task. We pondered whether to ask users for a scan of the original bill, thinking it would deter some of them (especially as our target audience was older than average). While it might have put off some, it increased the credibility of the data. We designed a point system and a peer-review mechanism to vet user contributions. This proved too convoluted for users, who had little incentive to make repeated visits to the website. It was used by the France Libertés team, however, whose 10 or so employees did feel motivated by the points system. We built an automated mailing mechanism so that users could file a Freedom of Information request regarding water pricing in just a few clicks. Though innovative and well-designed, this feature did not provide substantial ROI (only 100 requests have been sent). France Libertés partnered with consumers' rights news magazine 60 Millions de Consommateurs, who got their community involved in a big way. It was the perfect match for such an operation. The project gathered only 45,000 visitors in 4 months, equivalent to 15 minutes worth of traffic on nytimes.com. What’s really important is that 1 in 5 signed up and 1 in 10 took the time to scan and upload his or her utility bill.